August 2014 ForResidentialPros.com | 41 By Anita Shaw Creative Countertop Designs T here are numerous elements that can cre- ate the "wow" factor in a kitchen. Range hoods, back- splashes and eye-catching appliances have traditionally been the focal points that get the lion's share of attention, while countertops have been a member of the supporting cast, anchoring the space as part of the backdrop. Not anymore. As the range of coun- tertop materials continues to expand, creative ways to use those materials multiply exponentially. Kitchen de- signers continue to push the boundaries when devising pe- rimeter and especially island designs, and topping these areas of with something av- erage is no longer acceptable. INSPIRED DESIGN Designers employ a number of factors when determin- ing the right materials and shapes for the countertops within a space. 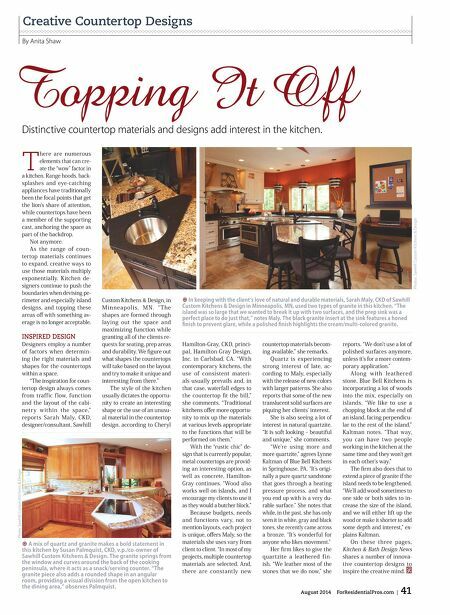 "The inspiration for coun- tertop design always comes from traffic flow, function and the layout of the cabi- netr y within the space," reports Sarah Maly, CKD, designer/consultant, Sawhill Custom Kitchens & Design, in M i n ne ap ol i s, M N. " T he shapes are formed through laying out the space and maximizing function while granting all of the clients re- quests for seating, prep areas and durability. We fgure out what shapes the countertops will take based on the layout and try to make it unique and interesting from there." The style of the kitchen usually dictates the opportu- nity to create an interesting shape or the use of an unusu- al material in the countertop design, according to Cheryl Hamilton-Gray, CKD, princi- pal, Hamilton-Gray Design, Inc. in Carlsbad, CA. "With contemporary kitchens, the use of consistent materi- als usually prevails and, in that case, waterfall edges to the countertop ft the bill," she comments. "Traditional kitchens ofer more opportu- nity to mix up the materials at various levels appropriate to the functions that will be performed on them." With the "rustic chic" de- sign that is currently popular, metal countertops are provid- ing an interesting option, as well as concrete, Hamilton- Gray continues. "Wood also works well on islands, and I encourage my clients to use it as they would a butcher block." Because budgets, needs and functions vary, not to mention layouts, each project is unique, ofers Maly, so the materials she uses vary from client to client. "In most of my projects, multiple countertop materials are selected. And, there are constantly new countertop materials becom- ing available," she remarks. Quartz is experiencing strong interest of late, ac- cording to Maly, especially with the release of new colors with larger patterns. She also reports that some of the new translucent solid surfaces are piquing her clients' interest. She is also seeing a lot of interest in natural quartzite. "It is soft looking – beautiful and unique," she comments. "We're using more and more quartzite," agrees Lynne Kaltman of Blue Bell Kitchens in Springhouse, PA. "It's origi- nally a pure quartz sandstone that goes through a heating pressure process, and what you end up with is a very du- rable surface." She notes that while, in the past, she has only seen it in white, gray and black tones, she recently came across a bronze. "It's wonderful for anyone who likes movement." Her frm likes to give the quartzite a leathered fin- ish. "We leather most of the stones that we do now," she reports. "We don't use a lot of polished surfaces anymore, unless it's for a more contem- porary application." A long w it h leat hered stone, Blue Bell Kitchens is incorporating a lot of woods into the mix, especially on islands. "We like to use a chopping block at the end of an island, facing perpendicu- lar to the rest of the island," Kaltman notes. "That way, you can have two people working in the kitchen at the same time and they won't get in each other's way." The frm also does that to extend a piece of granite if the island needs to be lengthened. "We'll add wood sometimes to one side or both sides to in- crease the size of the island, and we will either lift up the wood or make it shorter to add some depth and interest," ex- plains Kaltman. 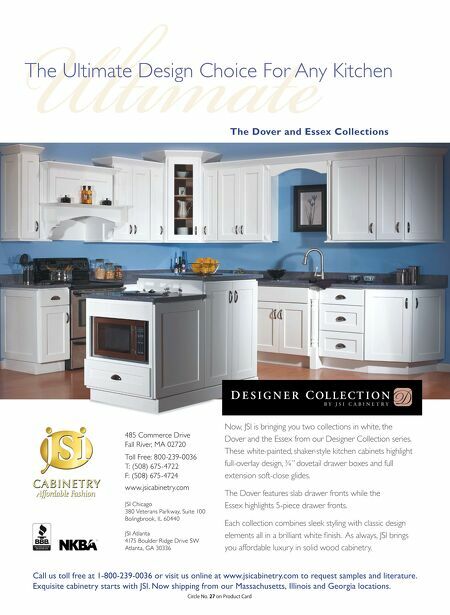 On these three pages, Kitchen & Bath Design News shares a number of innova- tive countertop designs to inspire the creative mind. ⊕ In keeping with the client's love of natural and durable materials, Sarah Maly, CKD of Sawhill Custom Kitchens & Design in Minneapolis, MN, used two types of granite in this kitchen. "The island was so large that we wanted to break it up with two surfaces, and the prep sink was a perfect place to do just that," notes Maly. The black granite insert at the sink features a honed fnish to prevent glare, while a polished fnish highlights the cream/multi-colored granite. ⊕ A mix of quartz and granite makes a bold statement in this kitchen by Susan Palmquist, CKD, v.p./co-owner of Sawhill Custom Kitchens & Design. The granite springs from the window and curves around the back of the cooking peninsula, where it acts as a snack/serving counter. "The granite piece also adds a rounded shape in an angular room, providing a visual division from the open kitchen to the dining area," observes Palmquist. Photo: Sawhill Custom Kitchens & Design Photos: Sawhill Custom Kitchens & Design Distinctive countertop materials and designs add interest in the kitchen.